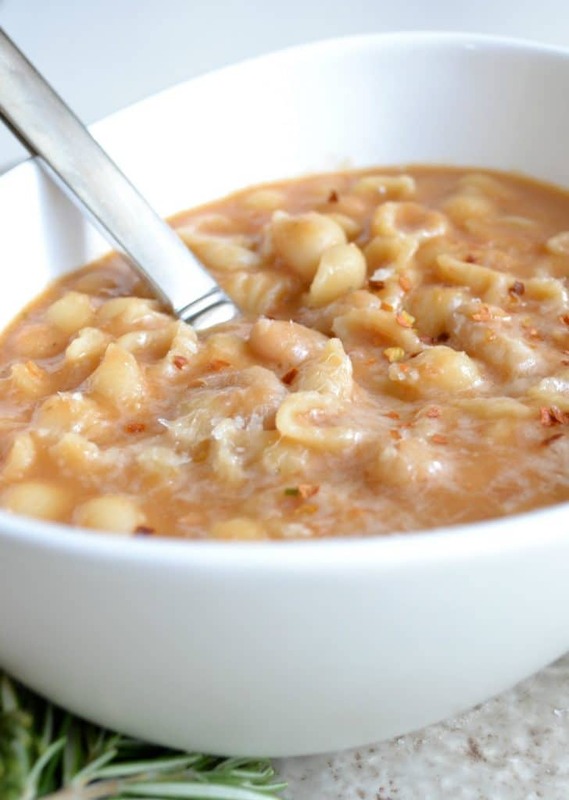 This traditional pasta e fagioli recipe (commonly referred to as pasta fazool) was passed down from a native Italian. 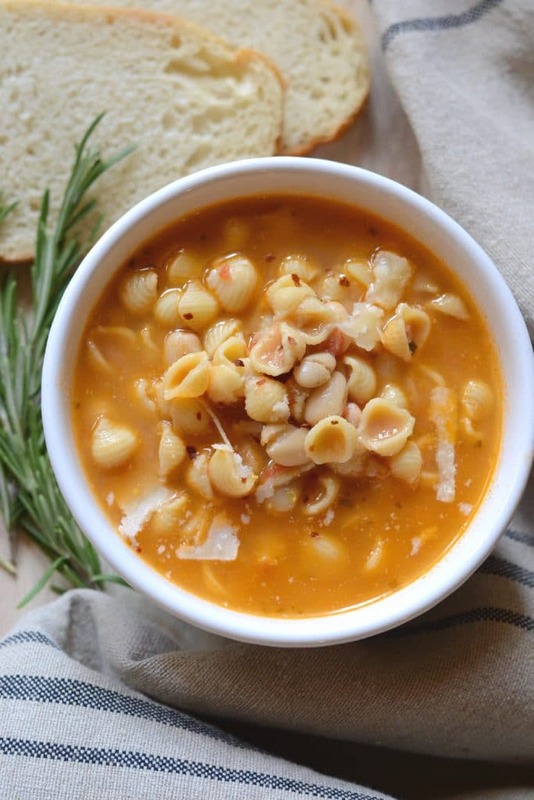 Made with cannellini beans, pancetta, pasta, and rosemary, this soup is comfort food at its finest, and truly my family’s favorite meal. There are only a few meals that my whole family gets really excited about. I’m not talking about a lackluster “yum,” but rather a jumping up and down, arms thrown around my waist, screaming “You’re the best mom/wife EVER!” sort of excited. Pasta e fagioli (which means “Pasta and beans” in Italian) is one of those dinners. If you’ve had pasta e fagioli at the Olive Garden, you’ll find that this recipe is nothing like that imposter. Sorry, Olive Garden lovers. This traditional Italian pasta e fagioli recipe is not tomato based, nor does it contain carrots, celery or ground beef. And I don’t mean to country drop, but I have had pasta e fagioli in Italy and it was pretty close to mine, although I still think this recipe is better. Sorry, Italy. 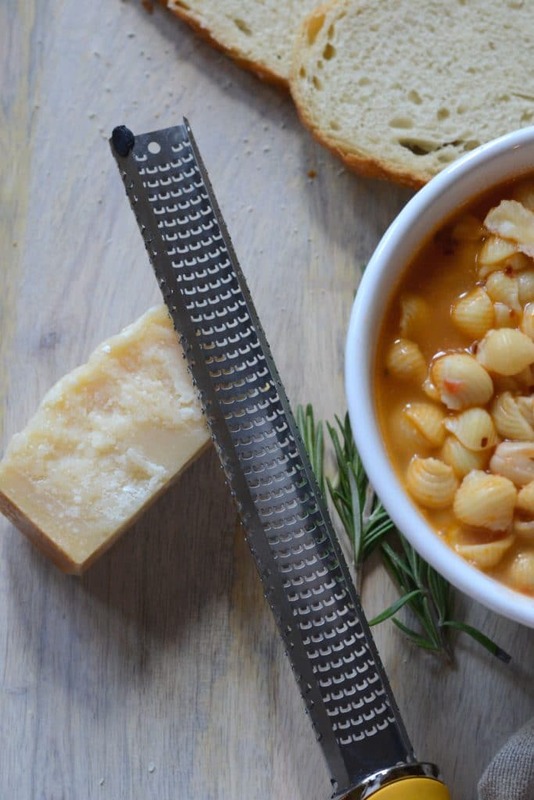 This pasta e fagioli has a combination of small pasta shells, cannellini beans, pancetta and rosemary, which gives it an earthy, smoky flavor that’s to die for. And it MUST be served with crusty bread, so that you can soak up every last drop of the thick, delicious broth. What makes this recipe a little different than others is that the bulk of the ingredients are pureed. This gives it an amazingly creamy texture (despite being dairy free). When I first started making pasta e fagioli, I based it on a recipe I found from someone’s Italian grandfather. It ended up tasting great, but the recipe was a little over-complicated, IMO. 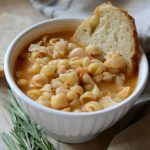 Over the years I’ve pared it down to the essentials and learned to make pasta e fagioli as simply as possible without sacrificing any of the flavor. If you own an immersion or stick-style blender , you can save yourself some time and dishes by blending the soup right in the pot instead of in a blender. Here’s an affiliate link to the immersion blender I use, in case you’re interested. If you find that the soup is getting too thick as the pasta cooks, feel free to add a little more broth or water. It’s supposed to be thick, but you want it to still be soupy. Conversely, if it seems a little too watery, just let it sit on the stove (with the burner off) for a bit. The pasta will thicken it up over time. 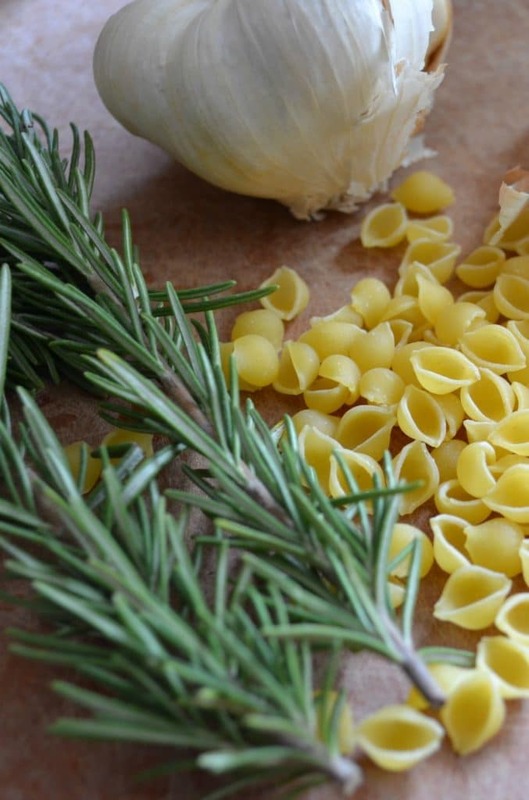 I prefer to use small shells when making pasta e fagioli, but if you can’t find those at the store, you can substitute ditalini, macaroni, small orecchiette, or any other type of small noodle. In case you missed it the first time, you must, MUST serve this soup with crusty bread. I’m not messing around about this. It’s also delicious paired with a simple balsamic vinaigrette salad or a caprese salad made with fresh tomatoes, fresh basil and buffalo mozzarella. 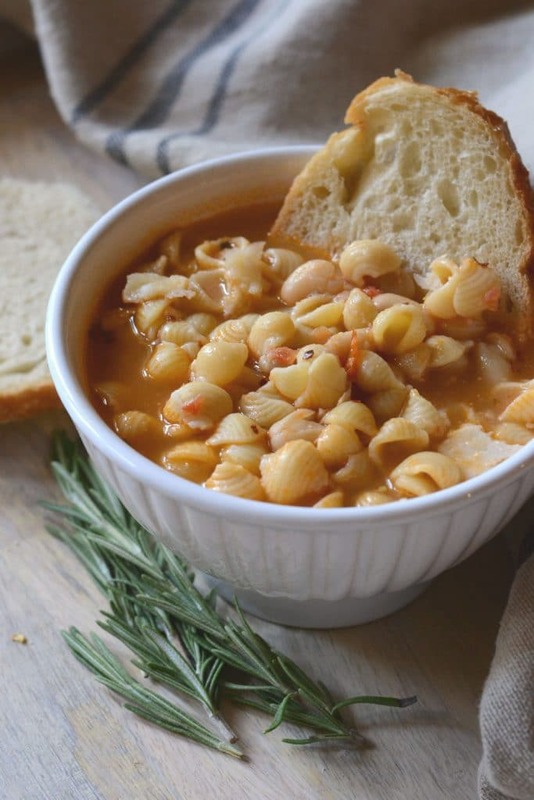 This traditional recipe for Pasta e Fagioli (pasta fazool) is simple comfort food at its finest (and nutritious to boot). In a large soup pot, heat olive oil. Add onion and pancetta and saute until onions are golden, about 5 minutes. Add garlic and rosemary and saute about 4 additional minutes. Transfer sauteed ingredients to a blender or food processor and add the two other cans of beans (liquid included). Puree until smooth. Add the pureed mixture back into the pot, along with the drained beans, the chicken and beef broth, salt, and crushed tomatoes. Bring to a boil. Once boiling, add the pasta and cook until al dente, stirring occasionally to prevent sticking. Once the pasta is cooked, remove from heat. Taste, and add more salt if necessary. Serve, topped with red pepper flakes and parmesan cheese, if you like. If you're watching your salt, start with 1 tsp salt and work up from there. You may find that the soup gets a little too thick as the pasta cooks. If so, just add some more broth or water to thin it out. If you make this recipe, please come back and tell me what you think. Hopefully your family will love it as much as mine does. Don’t leave without checking out my full RECIPE INDEX for more good + simple recipes! We love this at my house. I make it often. It’s one meal I know everyone will eat! I usually make a double batch and freeze the leftovers. I’ve been waiting for a great recipe like this because so many Italian restaurants just don’t make it this delicious and this authentic. This is as good as it gets. It’s easy to make but don’t let that fool you. The flavors are wonderful. The texture is perfect. And its stays hot forever because the pasta is cooked in the soup. This will be a staple in our house forever! I make this soup all winter. It’s so easy (even with a newborn to attend to) and delicious. It’s the closest recipe I’ve found to the soup we used to eat at my favorite Italian restaurant.